This figurine is a replica of a discovery in Cyprus, and it is on display at the National Museum of Cyprus in Nicosia. It is a clay trireme model that was also used as an oil lamp. Sailors often presented clay ship models as votive offerings at religious sanctuaries. In form this ship resembles a Phoenician merchant vessel. Most of the clay ship models found on Cyprus come from Amathus, a city with close connections to Egypt. The models are often found in tombs, which may reflect Egyptian custom. 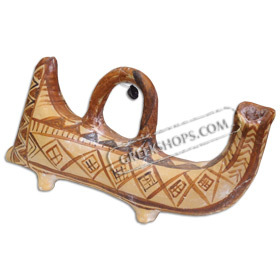 This fine museum quality replica is a unique "one of a kind" ceramic reproduction made from clay originating from the same fields where the original was found to ensure the same "look and feel" as the actual piece. All paint decorations were also made replicating methods used by potters of the particular period. This is why this item is hard to distinguish from the original and requires the attached traditional lead stamp (shown as part of the description tag) that identifies it as a reproduction made by an auathorized artist. Like the actual museum displays each piece is tagged with its description. .